An upside of going through narcissistic abuse? Really? Because it feels like hell! Well, yes, there are some positive things you can learn after you have been abused by a narcissist. At first it’s rough to cope with everything you’ve been through. In fact, for years, you will have setbacks. Narcissists don’t let go of their prey easily, and they definitely don’t want you to expose them. They will destroy your reputation and credibility before they will willingly let you share your story. You might feel great for a while, then one day you’ll get a nasty reminder that your ex narcissist is still out there. But, slowly you recover and realize just how strong you are. It’s empowering to look back and realize all that you’ve survived! Sometimes I think about the rough times I’ve endured and I think “wow. I am one strong woman. I DID that!” I have faced severe abuse, libel, slander, bullying and worse. You will also learn to examine people’s words and actions more critically. Maybe a narcissist charmed and fooled you once, maybe more, but one day, things will click and you will see more clearly than you did before. Narcissists will become very easy-to-read, and very predictable. When one tries to use some romantic lines on you, you won’t be having any of that, thank you! While the general public might still be fooled by your ex or other narcissists, you will see with new eyes and recognize predators among you. (And sadly, statistics show that there are a LOT of predators out there.) Once you are armed with education and you become a human narc detector, you will feel and be much safer in the world. You are no narcissist’s puppet! Wisdom comes too. Perhaps at first, you tried to fight back and argue with your ex narcissist or you tried to reason with them. As you recover, you realize this is a waste of time and a losing battle. You learn to save your time and protect your peace of mind. You learn not to care what bullies think. You know to bow out of any arguments they try to drag you into. You know the value of YOU. 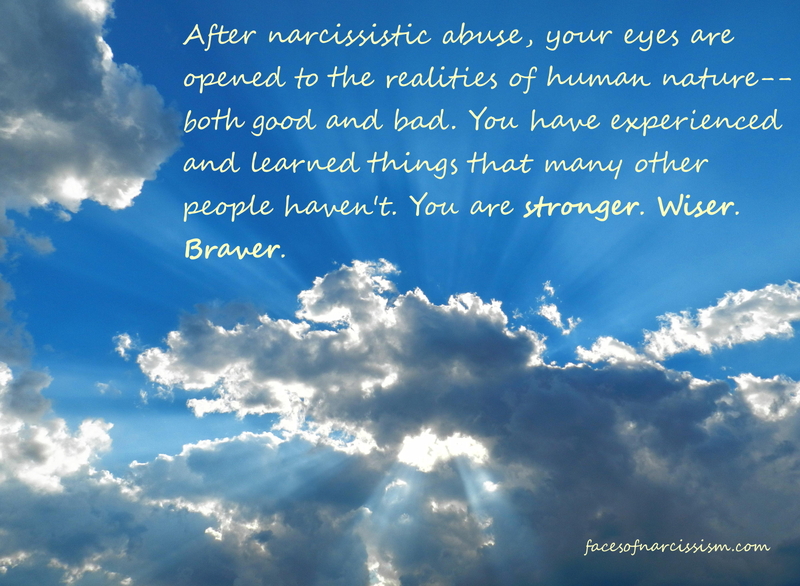 Maybe you knew some of these things pre-narcissist, but after the narcissist, you can become a new and stronger, smarter, braver, wiser person. Going through the pain of narcissistic abuse teaches you things that other people can never understand without having the same experience. And you can share that wisdom with the next person. You know the truth about narcissism that no narcissist will ever learn.